11. Frequency key : Selects frequency. Closes sub-menu. 12. Up and down arrows : Adjusts the locator signal gain. Scrolls through the menu options. 13. Antenna key : toggles Peak, Peak+, Null, Broad Peak and Guidance modes. Opens a sub-menu. 15. Transmitter key : Sends iLOC commands to Bluetooth transmitters. 16. Indicates the signal strength and Peak marker. 17. Signal strength: Numerical indication of signal strength. 18. Null / Proportional Guidance arrows: Indicates the location of the line relative to the locator. 20. Gain and Log number: Displays the log number momentarily after a survey measurement is saved to memory. 23. Radio Mode: Indicates when Radio Mode is active. 24. Power Mode: Indicates when Power Mode is active. 25. Accessory indicator: Indicates when an accessory is connected. 26. CD Mode icon: Indicates when Current Direction Mode is active. 27. A-Frame icon: Indicates when the A-Frame is connected. 29. Bluetooth icon: Indicates status of Bluetooth connection. Flashing icon means pairing is in progress. Solid icon indicates an established connection is active. 30. Antenna mode icon: Indicates antenna selection: Peak, Null, Peak+ and Guidance Mode. 31. 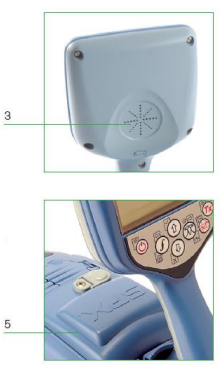 Sonde icon: Indicates that the signal source is from a sonde. 32. 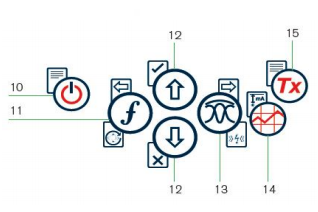 Line icon: Indicates that the signal source is from a line. 33. Compass indicator: Shows the direction of the located cable relative to the locator. 34. Tx status (with Bluetooth Tx models): Transmitter communication status - confirms successful iLOC /communication. 35. Tx standby (with Bluetooth Tx models): Indicates that the transmitter is in Standby Mode. 37. GPS Status icon (GPS models only): One bar indicates that GPS is active. 3 bars indicates that the GPS has locked to the GPS satellite system. 38. 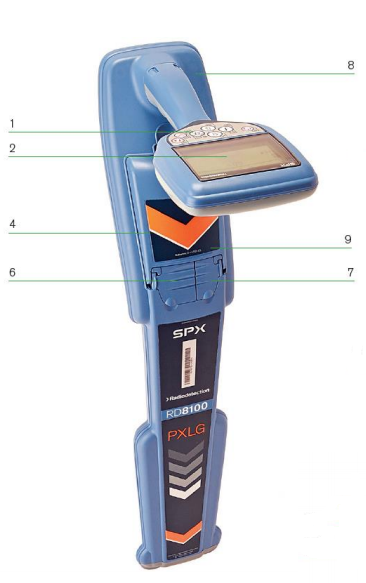 GPS Signal quality icon (GPS models only): Indicates the quality of the signal being received.